The following table lists are intended to guide instruction using UDL principles without the aid of high level technology (i.e. low tech). Low tech may include items that are readily accessible in most classrooms and require minimal cost to produce. Many teachers who are attracted to UDL as an idea are unsure whether they can actually imple­ment it in view of their limited access to technology or their limited fluency in its use. This paper examines the question of whether technology is central to the foundations of UDL or whether UDL is useful as a pedagogical framework that goes beyond technology. Based upon a lesson that is famil­iar to most elementary school teachers, the following paper from the National Center on Universal Design for Learning, uses the UDL guidelines as a structural framework through which to examine these questions. Whether in architecture or in education, it is easier and more effective to build solutions for everyone from the start rather than retrofitting solutions later on. Researchers at the Center for Applied Special Technology (CAST) realized that some of the basic elements of universal design – its flexibility, inclusiveness, foresight in anticipating people’s needs – could be applied in the field of education. And they have found that, just as with universal design in architecture and product development, UDL winds up helping all of the students in a classroom, regardless of ability or disability. After reading the UDL Case Study, take a virtual tour of classroom to see every day examples of UDL Principles. 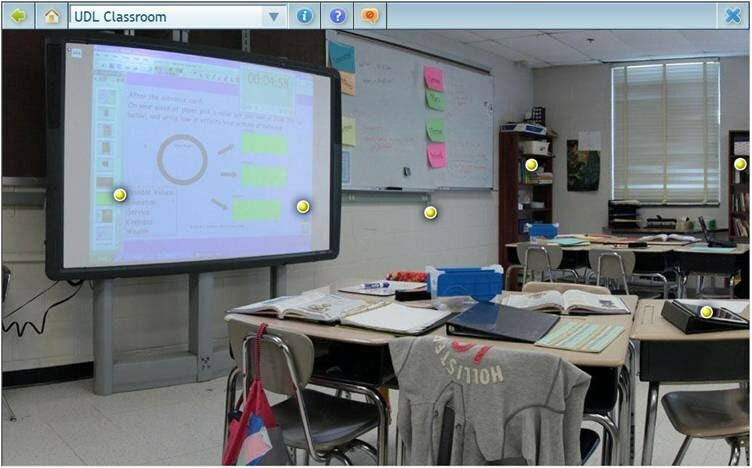 To navigate through the classroom, click and drag the mouse to the left or right. Click on hotspots and magnifying glasses to zoom in on specific examples. You might recognize your own classroom in some of the examples featured here! NOTE: Some features of the virtual tour are unsupported in Internet Explorer. It is best to use Firefox or Chrome to interact with the virtual tour. Find specific strategies for a particular subject and area of need.